I am a supporter of the charity Hour Children and all the good work the founder, Sister Tesa, does. 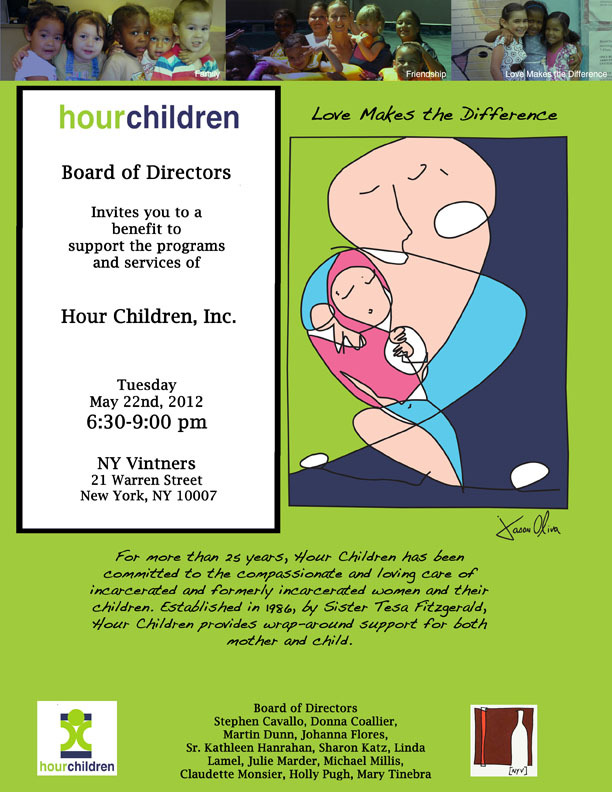 I am pleased to announce that I have helped to organise, alongside Julie Marder and the Board of Directors of Hour Children, an evening event at New York Vintners. There will be great wine and great food from Chef Ryan Smith and the room will be decorated with all of my latest artwork. I even re-imagined my Mother and Child painting to adorn the invitations. It will be a great night and all the proceeds will go to support Mother Tesa and her Hour Children charity. Thank you for your support and please feel free to share. Hour Children was born and continues to grow because of people like you who “get” our mission. You understand the trauma to a child when their mother is incarcerated, and the pain and the guilt experienced by the mother. In the midst of all this there’s hope – real hope that walks with mothers – from behind prison walls to the promise of a new life. Over the course of the past twenty-five years Hour Children has been there with a dedicated, compassionate staff who welcome women from prison or jail and wholeheartedly provide a home and vital support systems to build a life. Hour Children stands in testimony to your innate goodness hour relationship grows stronger as countless women have rebuilt their families and are now vital contributors to our society. As we grow into our future I offer deep gratitude to each of you for your generosity and commitment to Hour Children’s mission. Your love has truly made a difference! Next 'Breaking Bread' Alternative dining experience at New York Vintners: Start Memorial Day Weekend in NYC off right! Join Jason, Ryan and Dylan for an amazing evening of food and wine.